Reidy Creek is regarded as one of the country’s finest and challenging par 3 courses. Reidy Creek was carefully designed by course architect Cal Olson to maximize its natural valley setting to offer 18 distinctive holes. Every hole at this Escondido golf course is unique and the undulating, well maintained greens are protected by dramatic bunkers and water features. 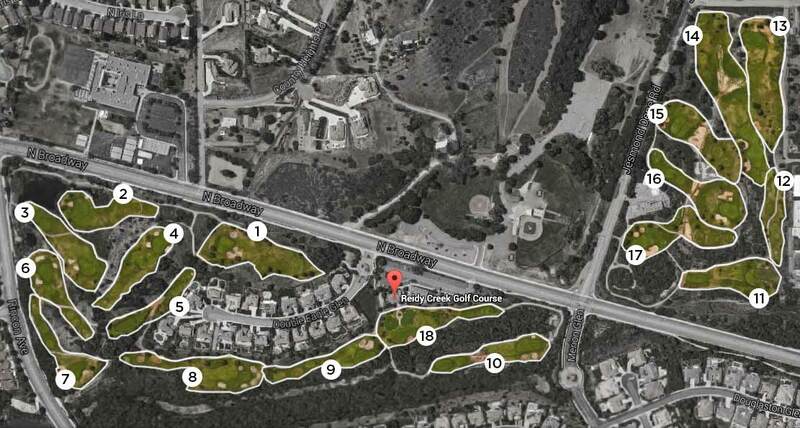 You’ll notice the front nine is tighter than the back nine and the holes are generously spaced as you glide through this natural layout at the base of the Escondido Mountains. Its scenic design provides a challenge to experienced golfers and lends itself to be extremely playable for the beginner. 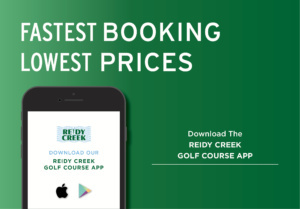 One of the great benefits of Reidy Creek is you can play 18 holes in less than three hours. The value combined with the challenge and condition of the course makes Reidy Creek a hidden gem amongst the county’s golf courses. In the Creekside Tavern you may indulge in a wide variety of your favorite beers and wines including some of San Diego’s finest award winning local brews. You will also enjoy a variety of snacks paired with the friendliest and always professional staff. The golf professionals on staff are able to accommodate your needs for group clinics and individual lessons as well. 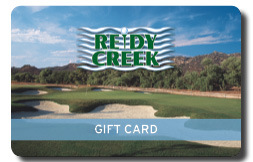 Make Reidy Creek your next choice for a quick round of golf with your friends and family or your next group tournament. Greens, Fairways and Tees: 100% recycled water. Complementing Reidy Creek Golf Course is the Clubhouse and Creekside Tavern. The Creekside Tavern hosts a large selection of local craft beers and quick menu items. The clubhouse is an ideal venue for meetings and special events. Contact the Pro Shop (760) 740-2450 for more information. Reidy Creek is the perfect choice for hosting a golf tournament, with its signature service combined with excellent course conditions and pricing that provides one of the most competitive values in the Southern California golf market. In addition to great golf, Reidy Creek offers a beautiful banquet facility and several dining options for your tournament guests. Contact our Tournament Sales Director for more information on how to host your next tournament or outing. Personalized Golf Lessons are also available at Reidy Creek from our PGA Golf Instructors. 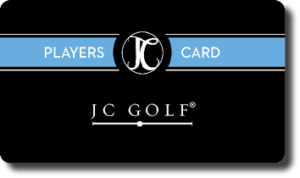 For more information, call the pro shop: (760) 740-2450 or email slyons@jcresorts.com. For junior golf programs, visit JC Junior Golf and learn about how your junior can play in the Annual JC Junior Tour. Junior golfers have the opportunity to play competitive golf at JC Golf courses throughout San Diego including Reidy Creek. The Reidy Creek Men’s Club provides multiple formats and playing opportunities, with standing tee times on Thursdays at 8am and Saturdays at 7:30 am. Members receive an executive course handicap from the SCGA that is kept in-house for as little as 5 rounds played. Join in on the fun and friendly competition for just $20 with Cart per round. A BBQ is held once/month after Thursday league play. For more membership information, contact Kevin Kelly, President at (858) 294-3694 or Bill Eichler, Secretary at (760) 580-6664 or email wceichler@hotmail.com. The Reidy Creek Women’s Club provides a friendly and competitive atmosphere every Monday morning. Play opportunities, with standing tee times on Mondays at 8:00am. Mondays 8:30am $20 with Cart. For more membership information, contact Jan Seeley at (760) 743-6858 or janseeley1@gmail.com. A month-long, multi-round eclectic tournament. Your scorecard will be turned in at the end of each round and compared to all previous rounds you have played. The lowest overall scores for each hole will be combined to make your eclectic score. • April 20 Awards Ceremony, with prizes, food, and day-of contests! Just $29/4 players (a $48 value for 9 holes). Book tee times and footgolf kick-off times at Tee Times at Reidy Creek or call the pro shop for assistance. (760) 740-2450. Mention special at the time of check in to receive discounted rates. ** Times apply to Daylight Saving Time, starting March 11, 2018. For club rentals, contact the pro shop at (760) 740-2450. The 18 holes play through a natural valley, providing the course with a rolling terrain that ensures no two holes are alike, something rarely found on an executive course. Fairways follow the naturally undulating landscape while the course’s greens are protected by water features and dramatically sculpted bunkers. The result is a distinctive course with an array of challenges requiring exact shot making for lower scores. Save with the Fab Five Card! Includes 5 Rounds of Golf or Footgolf at Reidy Creek! 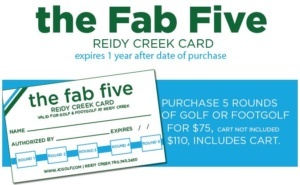 For just $75, the Fab Five Card expires 1 year after date of purchase. For $110, cart is included. The Fab Five Card is available for purchase at the pro shop.